Meets at Old Country Buffet, Downington, Pa. Meetings are the third Tuesday, except for Jul & Aug, 12:00 noon. Dues $8.00. DOYLESTOWN #740 RICHARD HOGG, President . Meetings: Giuseppe's Restaurant, Warrington, Pa, 2nd Thursday at noon except Jan/Mar/May/Jul/Sep. Dues $3.00. EASTON AREA #1102 RALPH POWELL, President. Meets every 1st Thursday at 1 PM except July & August at the Palmer Library, Easton. Dues $5.00. NORRISTOWN #372 GEORGE SHAL, President. Meets every 1st Wednesday of the month at 1 PM except January & February at RAY'S DINER, East Norriton, Pa. Dues $8.00. SCHUYLKILL #413 GEORGE A. LESCOSKY, President. Meets every 2nd Tuesday of the month except February, July, & August at 1 PM at the Yorkville Hose Company Fire House, Pottsville, Dues $5.00. 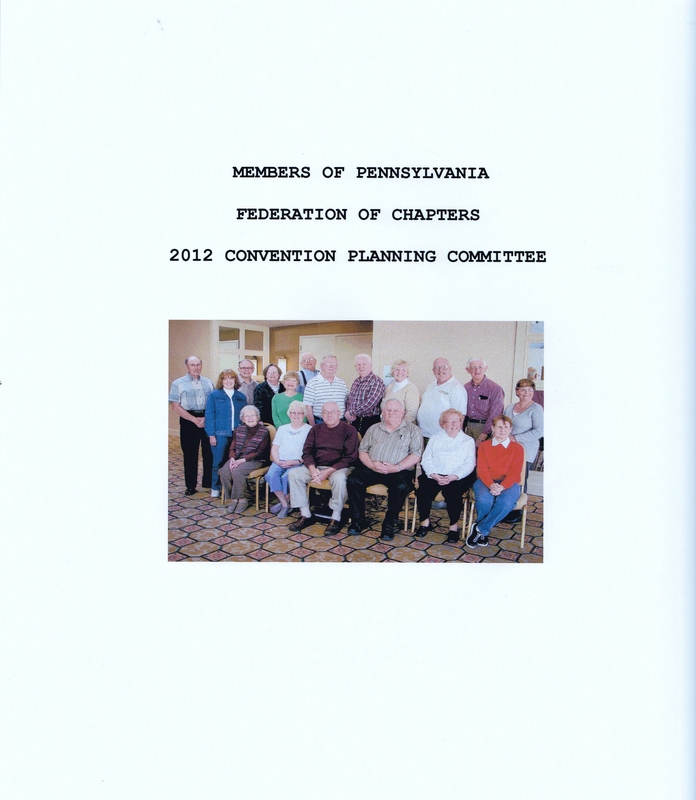 To meet with officers of our seven (7) Chapters at a predetermined time and place at a centralized location to discuss Chapter problems and offer helpful solutions with the possibility of involving the Pennsylvania Federation of Chapters representatives and also the Region II Vice President. At this time we welcome input by the individual Chapters of what works for them that would benefit the other Chapters. President and 1st Vice President. Change Make-up of Executive Board. PA04 Proposed Amendment to NARFE Pa.
Report be added to this module. and interviews but does nothing else. interview all candidates for office. Serves all ACTIVE and RETIRED federal employees in the United States, Panama, Puerto Rico, and the Philippines. As a member, you will have access to member relations staff twenty four hours, seven days a week, and more than 3,100 shared branches and 57,000 surcharge-free ATMs nationwide. NARFE membership is not necessary to become a member of the credit union. However, if you would like to be a member of both, NARFE PREMIER FEDERAL CREDIT UNION WILL PAY YOUR FIRST YEAR OF DUES. You become a member of two successful organizations. At the present time there is a 4% SAVINGS on savings account for Chapters. Click on "Become a Member." l. PUT YOUR OLD NARFE MAGAZINES IN BEAUTY SHOPS, BARBER SHOPS, HAIR DRESSERS, DOCTORS AND DENTIST OFFICES, DROP THEM OFF AT YOUR LOCAL POST OFFICE OR GIVE THEM TO YOUR POSTAL CARRIER. 2. 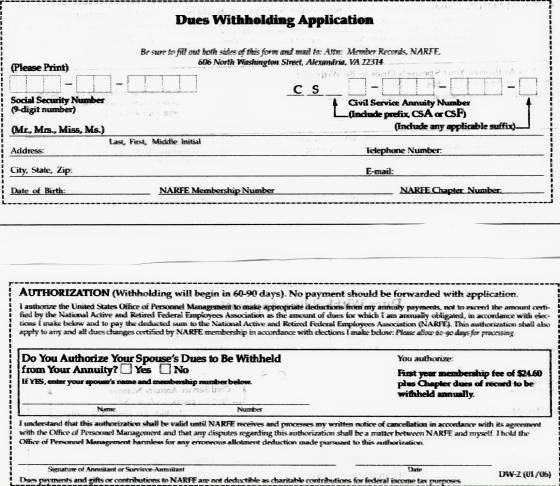 WHENYOU PLACE YOUR OLD NARFE MAGAZINE IN A BARBER SHOP, HAIRDRESSER, DOCTOR'S OFFICE, OR ANY OTHER PLACE OF BUSINESS, FIRST TURN TO THE PAGE WITH THE ENROLLMENT APPLICATION FORM. ENTER YOUR MEMBERSHIP NUMBER AND CHAPTER NUMBER ON THE FORM. THIS WAY YOU WILL GET THE CREDIT FOR RECRUITING A MEMBER SHOULD SOMEONE DECIDE TO JOIN NARFE. 3. ORDER RECRUITING POSTERS FROM THE NATIONAL MEMBERSHIP SERVICES TO PUT ON COMMUNITY BULLETIN BOARDS IN POST OFFICES, GOVERNMENT OFFICES, AND PLACES OF BUSINESS THAT WILL ALLOW THEM. 4. PROVIDE A FREE LUNCH FOR THE RECRUITER AND NEW MEMBER. 5. IF YOU GIVE A POSTAL CARRIER GIFT FOR CHRISTMAS, MAKE IT A GIFT MEMBERSHIP TO YOUR NARFE CHAPTER. 6. MAKE UP A RECRUITING PLACE MAT INDICATING CHAPTER OFFICERS NAMES AND PHONE NUMBERS. HAVE COPIES PRINTED (ELIGIBLE FOR MATCHING FUNDS) AND PLACE IN LOCAL RESTAURANTS. 7. ALWAYS CARRY NARFE MEMBERSHIP APPLICATIONS WITH YOU IN YOU CAR. 8. CREATE A NEW POSITION THAT OF RETENTION CHAIRMAN. 9. MAKE PERSONAL CALLS TO ALL MEMBERS RECEIVING SECOND DUES RENEWAL NOTICE. 10. SEND OUT DUES WITHHOLDING NOTICES EVERY SIX MONTHS. 11. INVITE SPEAKERS TO GIVE A TALK ON INTERESTING TOPICS TO ALL MEMBERS. 12. PROVIDE ENTERTAINMENT FOR SELECT MEETINGS. 13. HAVE A YEARLY PICNIC AND CHRISTMAS PARTY. 14. DROP OFF NEWSLETTERS AT ALL POST OFFICES. 15. WORK WITH LOCAL BUS COMPANY TO PLACE NARFE ADVERTISING/RECRUITING POSTERS ON THEIR BUSSES. CHESTER CHAPTER #377 SELLS 50/50 TICKETS AT ALL OF THEIR MEETINGS. 50% GOES TO THE ALZHEIMER'S FUND AND 50% TO WINNING MEMBERS IN ATTENDANCE. CHESTER CHAPTER #377 WILL PURCHASE A "CHESTER CHAPTER #377 MEMBER" NAME TAG FOR ANY MEMBER ATTENDING THREE (3) MEETINGS IN A ROW. SELECTED OFFICER'S WIVES OF SCHUYLKILL CHAPTER #413 PREPARE AND OFFER HOMEMADE MEALS AND DELICIOUS HOMEMADE DESSERTS AT ALL CHAPTER MEETINGS HELD AT THEIR ASSIGNED MEETING PLACE. A MONETARY DONATION IS ACCEPTED TO HELP DEFRAY THE COST OF THE FOOD. SCHUYLKILL CHAPTER 413 ADVERTISES OVER LOCAL RADIO STATIONS AND IN LOCAL NEWSPAPERS THE DATES, TIMES, AND PLACE OF CHAPTER MEETINGS. LEHIGH VALLEY CHAPTER WILL HOLD ITS ANNUAL PICNIC ON THUSDAY, JULY 26, 2012 AT 12 NOON AT ROSE GARDEN 2, ALLENTOWN, PA. COST PER PERSON WILL BE $16. PITCHING HORSHOES AND GAMES OF BINGO WILL BE THE MAIN ACTIVITIES. WHAT IS IT? WHAT DOES IT MEAN? WHAT DOES IT DO? WHY DON'T WE HEAR MORE ABOUT IT LIKE AARP AND OTHER ORGANIZATIONS? FIRST OFF NARFE IS AN ASSOCIATION CONSISTING OF BOTH RETIRED AND FEDERAL EMPLOYEES STILL WORKING FOR SOME PHASE OF THE FEDERAL GOVERNMENT. NARFE PROTECTS THE BENEFITS OF ALL ACTIVE AND RETIRED FEDERAL EMPLOYEES THROUGH REPRESENTATION AT CONGRESSIONAL HEARINGS, BY INCREASING MEMBERSHIP, BY ENSURING EACH MEMBER OF THE ASSOCIATION'S VOICE IS HEARD AND IS ADHERED TO IN LEGISLATION TO PROTECT AND PRESERVE THE RIGHTS AND BENEFITS OF ALL THE HARD WORK PERFORMED BY THE CONSCIENTIOUS FEDERAL EMPLOYEES DURING THEIR TENURE ON THE JOB. WE DON'T HEAR MORE ABOUT NARFE BECAUSE IT DOESN'T GET ENOUGH "EXPOSURE". WE HAVE TO GET THE WORD OUT FROM THE HIGHEST LEVEL, NATIONAL, FEDERATION, AND YES, AT THE CHAPTER LEVEL. WE MUST ADVERTISE AND PROMOTE NARFE THROUGH OUR CHAPTER MEMBERS, THROUGH NEWSPAPER ADVERTISEMENTS AND RADIO ANNOUNCEMENTS AND BY WORD OF MOUTH TO ACTIVE AND RETIRED MEMBERS OF THE FEDERAL GOVERNMENT.